Carmen is the only popular opera that prominently features bullfighting. The opera’s "Toreador Song," that noted earworm, describes a bullfight, and the opera’s final scene opens with the procession of picadores, banderilleros, and finally the matador (Escamillo) into the arena. View this sequence from Francesco Rosi’s beautiful 1981 film version of Carmen here. In recent years, bullfighting has become extraordinarily controversial; some champion it as an art form while others declare it a cruel blood sport. 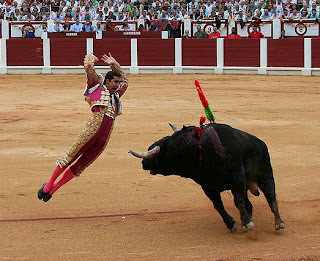 In fact, although bullfighting still thrives in parts of Europe and Latin America, it will be banned in Catalonia (the Spanish territory where Barcelona is located) beginning in January 2012. In the first stage of a bullfight, the matador gets his first look at the bull he’ll be going up against. After he uses a cape to make a few passes at the bull, two men on horseback—the picadores—ride out into the arena, armed with lances. [Left: A picador at a Mexican bullfight.] The horses are blindfolded, to keep them from getting spooked, and wear thick padding to protect them from the bull’s horns (this wasn’t always the case; before padding became common in the 20th century, horses were frequently gored). 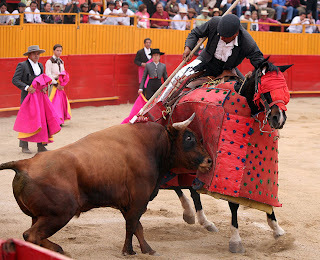 In this round, the picadores use their lances to stab the bull’s neck, weakening the muscles in preparation for the final stage. In the second stage, three men—known as banderilleros—enter the ring on foot, each carrying a pair of brightly decorated sticks (banderillas) with barbs on one end. Each banderillero must plant the barbed end of the stick into the bull’s shoulders, further weakening the neck and shoulder muscles and resulting in greater blood loss. 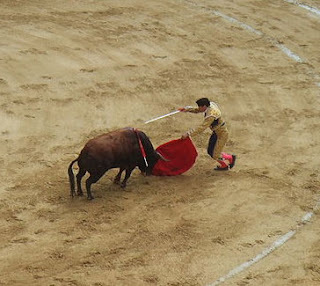 In this photo, Spanish matador El Fandi uses a risky technique to place the banderillas. The final stage, which takes fifteen minutes or less, is what most people think of when they imagine a bullfight: the matador, carrying a sword and a red cape, re-enters the ring to face the bull alone. Bullfight fans, or aficionados, often refer to bullfighting as a performance art—not a sport—and the interaction between matador and bull in the Tercio de Muerte can indeed resemble a dance. The matador conducts a series of passes using his cape, and the closer he allows the bull to his body, the more highly-prized the performance is. While the preceding two rounds are utilitarian in nature, the Tercio de Muerte is a deadly show (almost certainly for the bull, and possibly for the matador). Eventually, the matador maneuvers the bull into place and goes in for the killing blow, or the estocada (as pictured above, during a bullfight in Colombia). The goal is to cleanly thrust the sword between the bull’s shoulder blades, severing the aorta and delivering a quick death, further ensured by an assistant who severs the bull’s spinal cord with a small knife. If the matador has done a poor job—perhaps he struck a lung, instead—he may switch to a different sword, designed to puncture the spinal cord and paralyze the bull immediately. Depending on the perceived valor of the matador, the official presiding over the bullfight may award one or both ears and/or the tail of the bull to the matador as a trophy. • In Spanish, a bullfight is known as a corrida de toros ("running of bulls"). "Toreador," the term for a matador used in Carmen, is actually very rarely used in the world of corridas; torero is the preferred title. • The matador’s cape in the final tercio is red to hide bloodstains—not to infuriate the bull, which is actually colorblind. • Traditionally, bullfighting is for guys; in 1908, Spain even passed a law banning women from performing in the ring. The restriction was eventually lifted, but female matadors are still rare, and face immense opposition from audiences and colleagues. • Bullfighting is mostly practiced today in Spain, Portugal, France, Mexico, Venezuela, Colombia, and Peru. Ecuador has a long tradition of bullfighting but, earlier this year, Ecuadorians voted to continue bullfighting so long as the bulls aren’t killed. (A form of bloodless bullfighting exists in many parts of the world, including the United States.) Spain’s Catalonia and the Canary Islands have also banned bullfighting. • It’s not very common, but it is possible for a bull to survive the fight. If the crowd is particularly impressed by the animal’s performance, they can request for it to be freed. The bullfighter will perform a symbolic estocada with the palm of his hand, instead of the sword, and the bull will live out the rest of its life as a stud. Here’s a video of a bullfight where the crowd’s persistent cheering led to the bull being set free (you can see the symbolic estocada at around the 9:15 mark). What does it have to do with Carmen? It is often said that bullfighting is not only part of the Spanish setting, it’s a metaphor for the relationships between characters in Carmen. But that metaphor may shift, depending on your personal interpretation of bullfighting. Or, for that matter, your personal interpretation of the opera. Is the bull a powerful adversary, a thing to be respected and feared? Is Carmen the bull, too wild to be allowed to live? Or is the bull just an unwitting victim, helpless and doomed? Is José the bull, cornered and provoked and finally led off to the slaughter? Why does Bizet accompany the moment when José stabs Carmen with the cries of enthusiastic bullfight aficionados coming from the ring? Check out Hemingway's "Death in the Afternoon" for an even more detailed look at bullfighting that focuses on even more of the traditions and culture of the ring; as well as, the cult of hero worship centered around the matadors. Hallo, Tamara & Sea Op Blogreaders! A very interesting and informative article on a horribly perverse "sport"!! I'm most ghrateful audiences are not forced to watch this horrible spectacle in order to experience such a great opera!!! Toi, toi, toi for the Sea Op production!!! !